Gross Domestic Product (GDP) and other statistics based on national income accounting are ubiquitous but rarely understood today. GDP has been criticized for many reasons, including not reflecting well-being, leaving out the costs of environmental pollution, and not counting unpaid work, but on purely economic terms it has been mostly accepted as an indicator of economic performance. In recent decades, however, GDP has diverged dramatically from economic trends such as employment and median income. 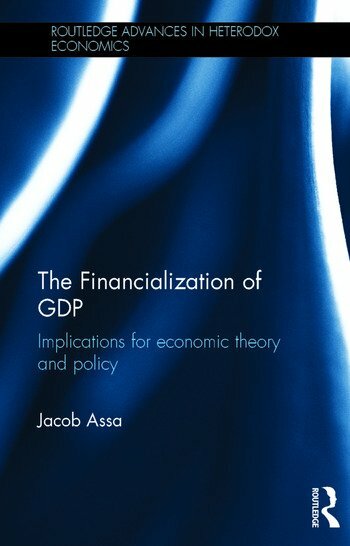 This book argues that GDP is flawed even as a narrow economic indicator, and traces the problem to the way financial services are measured. The first part of the book is a political history of the practice of national accounting from its beginning in the mid-17th century to present day, and explores how such income estimates were constructed for political reasons. The Financialization of GDP presents the practice of estimating national income as a historically and political contingent craft - driven by power and not only theory - culminating in the rise of the financial sector and the concomitant inclusion of financial services in GDP in 1993.. The second part of the book focuses on the treatment of financial services in national accounting and develops an adjusted measure of output (Final Domestic Product or FDP) – which treats financial revenues as intermediate inputs (or costs) to the economy as a whole. The final part of the book explores the empirical and policy implications of treating finance as an overall cost to the economy. This volume shows that the Great Moderation of volatility was a statistical artefact; Okun’s Law (relating changes in output and unemployment) never died, and even provides early signs for the Great Recession which analysts using standard GDP did not see. This book is of great interest to those who study political economy and macroeconomics. Jacob Assa is Economic Affairs Officer at the United Nations, New York. Born and raised in Israel, Jacob attended Hunter College in New York, and has been working at the United Nations since 1999. He received his master’s and PhD degrees in economics at the New School for Social Research.